I did something for myself on Saturday. but how I did it and what it meant. You could say the journey to my marathon experience Saturday started long ago and includes the entirety of my life, and I would agree with you. Some of the more recent seeds of my goals and plan for the race, though, start with where I was at when I signed up for it earlier in the year. I’d done another marathon last spring, and having not gone quite as fast in that one as I’d hoped for (though that was okay (another story for another time)), I had the thought, I should do it again and go for that Boston qualifying time. If I was honest with myself, though, I knew there was some ambivalence. Did I really want to train that much? 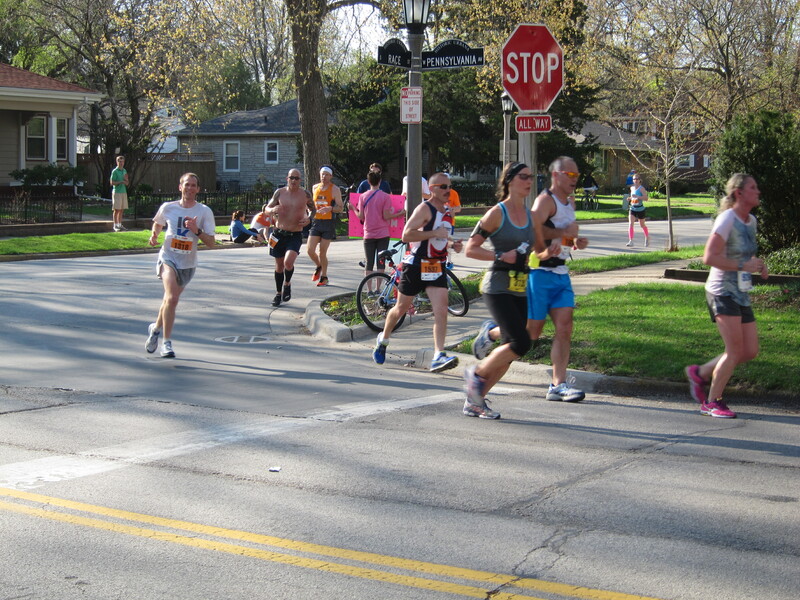 Should I really push my body in that way for that long (running for 26.2 miles)? What if I can’t do it? What if I fail? I immediately felt like I was in the wrong place. What I was hearing is what had historically been my mindset, but I’d already been thinking of a different plan for this race. I knew my training hadn’t been as good as last year and that I wouldn’t be able to get the aspired-for Boston qualifying time. I’d also been missing some sleep and ruminating on life recently following the ending of a short but impactful bit of dating, and I really just wanted to go for a run and enjoy it – to say, I’m just going for a long fun run. And to not feel like I needed to push for x or y time – to not have that as my focus – and also to not have my legs feel terrible afterwards. My marathon bag around 6:25 a.m., posing just prior to gear check. One more pit-stop, and then ready to go. The race started on time at 7:00 a.m., and it wasn’t long before the old mindset, still there just a little below the surface, worked its way up. Earlier, I’d told myself that a 7:30/mile pace (3:16:38 overall) would be a good target given my fitness and one that I could maybe glide along and enjoy things at. But the course was going to be flat! And now the 3:15 pace guy was right in front of me and planning to lead people to a 3:14:30 finish…which was halfway further to 3:13…which, who knows, maybe I could do if I felt great…and, shouldn’t I give it a shot to hit 3:13 if it was maybe possible?…and, 3:13!…which would be a great time and PR (even if not the 3:10 needed for Boston) and a great palindrome! My legs were feeling good for a while, and I was keeping up with the 3:15 group, but I knew I wasn’t relaxed. My thinking and focus were just, I need to stay with this group. It wasn’t until going through Meadowbrook Park, between mile 8 and 9, that my mind returned to me. This isn’t what I want, I told myself. And I won’t be able to keep this up anyway. Chasing a time is not my race today. My race is to enjoy it, to make it to the end still smiling and happy to be alive. To appreciate it. At the turn at Mile 11. Thank you Aaron and Jami and Mom for watching and cheering. So I slowed down a little. And I started to relax. And began to really smile. I was running by myself now (amidst the others around me), and now finally running for myself. It was a shift in mentality and remarkable because it wasn’t just about running, but life too. In a culture of feeling the need to please other people and meet their expectations and fit in, sometimes you have to stop and ask yourself, What do you want and need for you? And then be true to yourself and do that, rather than doing what you think others think you need or should want. I was listening to myself, and in that sweet spot of comfortableness and just running, came things like joy, gratitude, and connection. 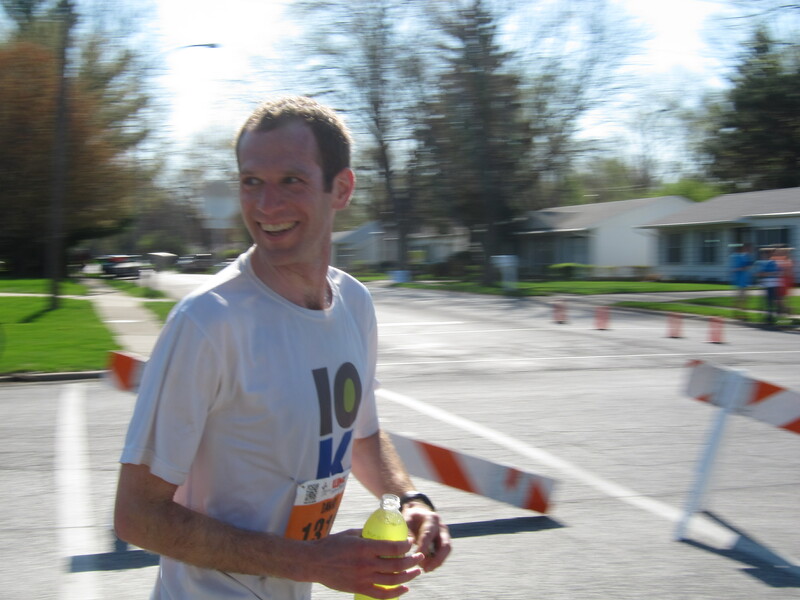 As I started the backstretch and moved through miles 13-20, I was smiling. A few times I looked up with open arms and thought, I love my life. 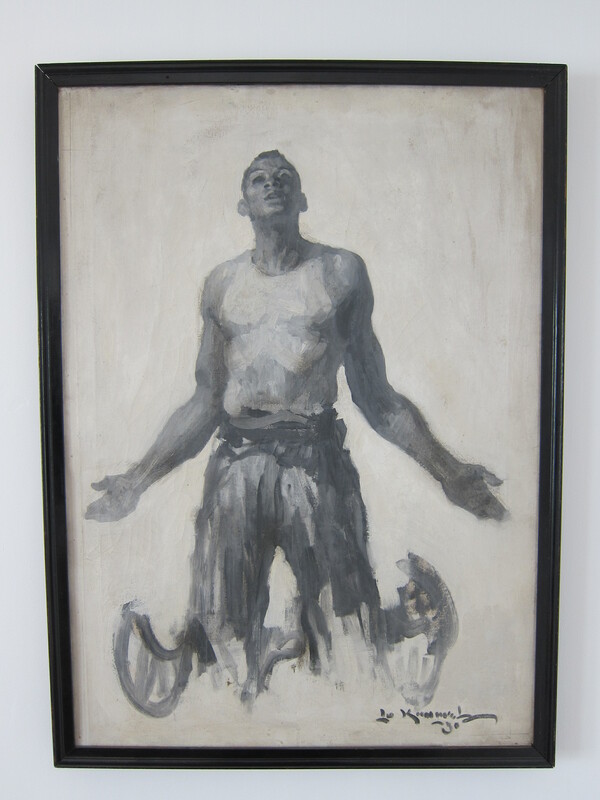 One of my grandfather’s paintings (1930). Its story isn’t known (still to be tracked down), but I like to see the gesture as one of welcoming life and whatever comes. People, families, and volunteers watching the race were cheering and encouraging me and everyone on, and when I would meet their cheers with a smile or other acknowledgment, they would go further and give me a little more. Which then made me appreciate them and smile even more myself. It’s true you get back what you put in and that we’re all connected. If you want love, part of it is you have to be open and willing to give some yourself. Looking good, right after getting a bottle of Gatorade from my brother at mile 18. Thank you also Jami for getting that on digital film. Keep going! You’re almost there!!! Give 100% in everything you do! 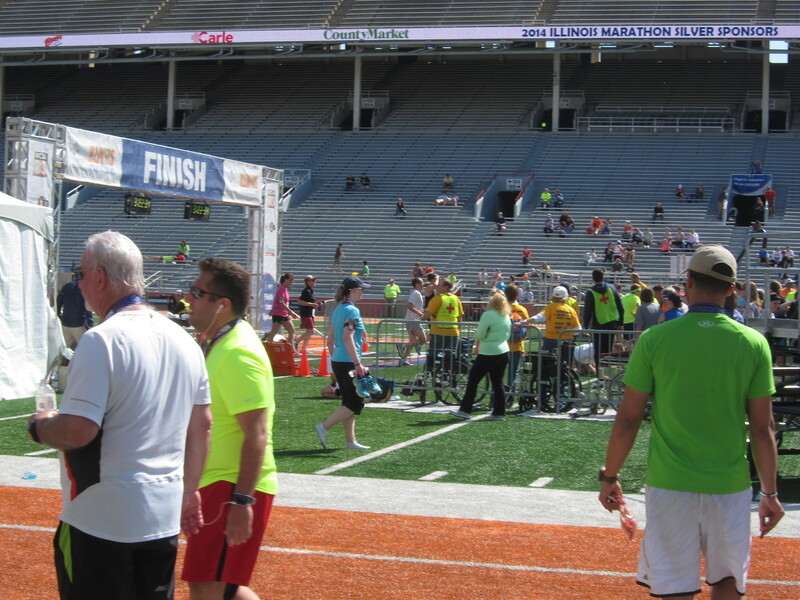 In the end, my final time was a few minutes faster than my first marathon and a few minutes slower than the one last year, but it wasn’t about the time as much as being right where I wanted to be. I continued to push beyond the presumed limits of my older ways of thinking and seeing, and I felt genuine appreciation and gratitude for the day. I appreciated seeing my family at miles 4, 11, 18, and 26.2, feeling and engaging the support of the crowd and volunteers, and even Coach GP for getting me thinking and providing some words and ideas for me to remake and claim for myself. All in all it was a great run. A view at the finish. If you look closely, you can see me. 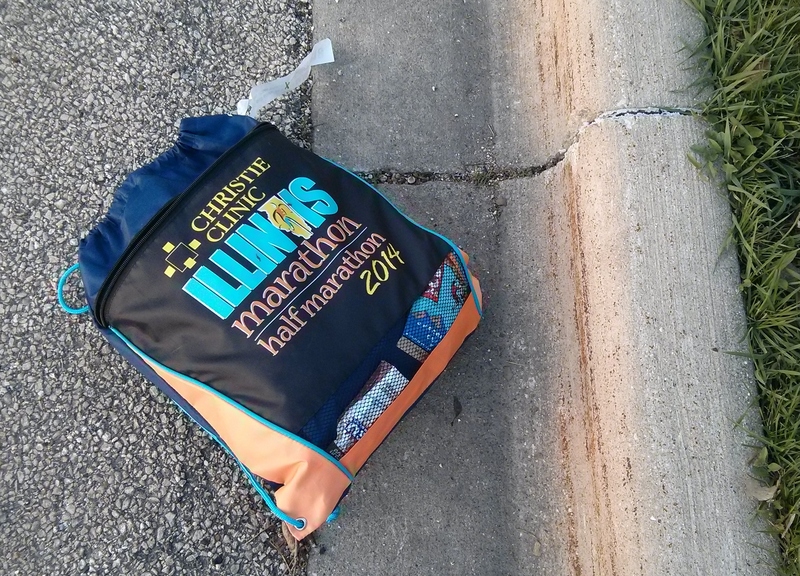 This entry was posted in Uncategorized and tagged appreciation, Illinois, life, marathon, running on April 28, 2014 by dave379.